Manitowoc has launched the new Sennebogen built GHC series of telescopic crawler cranes to dealers and customers at an event at its Shady Grove factory plant. The company used the Research & Development facility at the plant for introduction, with a full audio and video set-up that included lights, music and projection screens. A curtain dropped to a drum roll and attendees were invited to check out the new cranes. All three models, the 50 tonne GHC55, 70 tonne GHC75 and 120 tonne GHC130, were on show at the event which was also attended by Sennebogen staff. After the hands on session the cranes were put through their paces outside, with details given about optional equipment which include: pole claw, auger and working platforms. All three cranes have load charts with the machine level as well as two and four degrees out of level. 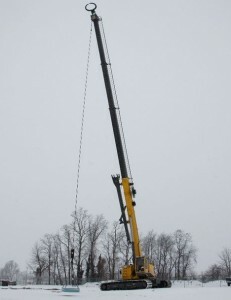 Manitowoc/Grove seems to have best dealer support and service….especially in America. Their crane care 24/7 phone line saved me so many times with tech and service support talking to people that build,operate and repair cranes….not some geek…Quality is excellent and parts available quickly.Will buy another GMK all terrain soon.iPhone,Amazon,eBay.